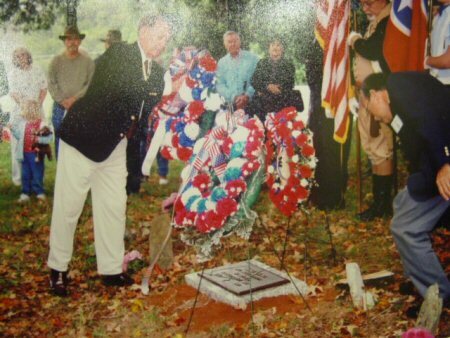 CHATTANOOGA - When Phebe Morgan found the grave of Revolutionary War soldier James Davis in north Hamilton County, she could barely read the "J DAV" inscription on the fading tombstone. 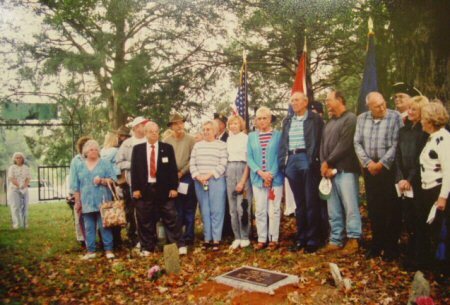 Now Davis has a new granite marker, which was dedicated at Montgomery Cemetery in a service led by the Cleveland chapter of the Sons of the American Revolution on Saturday. Morgan and her husband, W.J., were joined by dozens of other relatives at the service. A group clad in Revolutionary War period uniforms posted the colors. Other costumed guests held muskets. 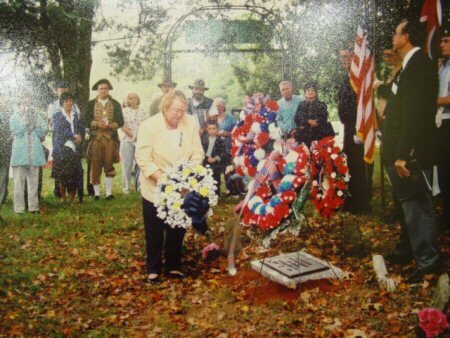 Flowers were placed around Davis' grave, which was shaded by towering maple and cedar trees and dusted with autumn leaves. "Events like these are useful reminders of the cost of citizenship in our great nation," said Compatriot Stanley A. Evans, president of the Col. Benjamin Cleveland Chapter of the SAR. "The public needs to remember such men and their deeds." Davis was born in 1761, approximately 50 miles west of present day Washington, D.C., in Fauquier County, Va. He died in 1843 at the age of 82. After volunteering to serve in the Revolutionary War at age 17, Davis served under Col. Cleveland, the namesake of the local SAR chapter. Davis later moved to various parts of Tennessee, including the 160 acres in the Snow Hill community where he and his family are buried today. "James and (his wife) Mary lived a simple, decent life," W.J. Morgan said. "Their legacy lives on in the hundreds of their descendants." Phebe Morgan spearheaded the effort to uncover Davis' story. While much has been discovered about Davis' life, pictures of the early American patriot and other details remain a mystery. "I have no idea if he was a happy man, what he looked like, whether he played the fiddle, or if he even went to church for that matter," W.J. Morgan said. Records showed Davis was buried in Sequatchie County, but further genealogy research led Phebe Morgan to the right graveyard. She rallied several other family members for the dedication. "I just wanted to know the history of our family," said Debbie Powell, who would be a distant granddaughter to Davis. "It's a part of history that will follow us forever," added Christy Bowman, another of Davis' granddaughters. Also in attendance for Saturday's service was Jim A. McCaffarty, who traveled from Ft. Washington, Md., to represent the color guard at Davis' grave dedication. "If the soldiers of the Revolutionary War hadn't done what they did, we wouldn't be here today," McCaffarty said. "They put their lives on the line." Doug Carpenter, a local member of the color guard, agreed. He said "we would be sipping tea and talking with funny accents" if the early patriots had chosen not to fight.